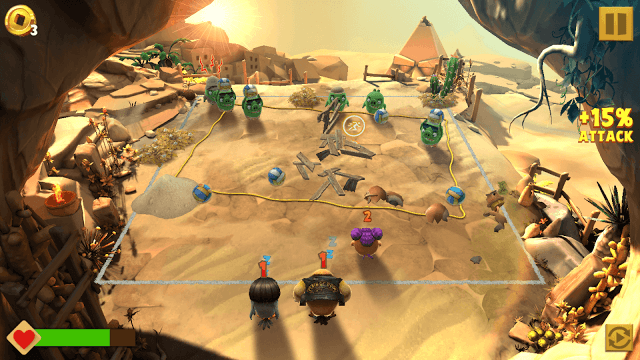 Evolution’s gameplay is reminiscent of Angry Birds: Action, but the former lets you fight pigs as opposed to collecting items and rescuing eggs. True to its name, the game introduces several evolved birds, something you have never seen before in any Angry Birds (AB) game. There are more than hundred new and wacky birdies to collect, level-up and evolve. Yes each bird can be evolved once he/she reaches its maximum level. 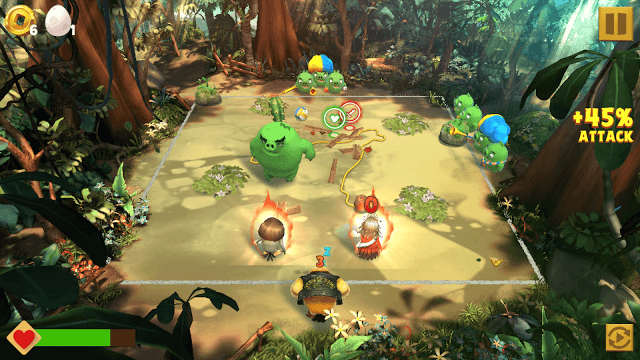 The game also throws new features, such as scouting that allows players to send three scouts on a mission to find bonus arenas and rewards. You can deal maximum damage to a pig by bouncing off rocks, wooden signboards and other stationary objects. Bouncing off objects to hit enemies from their back reduces more HP than hitting them directly. Drag a bird to aim an object and check whether the bird will rebound and hit a pig’s behind. The “aiming line” should help you get accurate shots. Check those dotted lines to see whether it touches a pig’s back before releasing a birdie. To get maximum effect, wait for a bird to activate his super shot and then use him/her to hit an enemy’s back. Leveling up birds not only makes them stronger, but also helps you free up space by sacrificing unwanted/one-star/duplicate birds. To level up a birdie in your team, all you need to do is fuse a one-star or duplicate bird with him. Go to “Edit Team” and the tap the “Level Up” tab. Next, drag a bird that you want to upgrade. Now, select a duplicate/one-star bird to fuse it with your main bird. Fusing two characters of the same color doubles your XP and you get more bird power points. Just drag a same-color bird to fuse it with your team member and you will notice that the XP you receive is more than the experience points received from other birds. Your bird’s power also doubles. If fusing a yellow bird with a white bird increases the yellow bird’s power by 12, fusing him with a bird of the same color will increase his power by 28 points. The power points you receive from fusion vary from one bird to another. To know how much bird power you will receive just drag a bird onto the empty space – don’t drop it. You are wasting precious time (and gold) if you are leveling up weaker characters. You should recruit stronger birds and level them up if you want to improve your team power. I would recommend recruiting two or three star birds to your team and using up all one star or duplicate birds to level them up. This way your team power will increase quickly. Power-ups appear randomly on a battle arena. They are activated when a bird moves through them, so drag and release a bird towards a power-up to collect it. There are various types of power-ups, such as attack, health and speed. Collecting an attack power (sword icon) will help you deal more damage to enemies at that moment. Going through a speed power-up augment a bird’s speed for a few seconds. Health (red heart icon) increases a bird’s HP. A digit above each pig shows the number of turns a pig takes to attack your bird gang. So if there’s a number 3 above an enemy’s head, it means that it will attack after three turns. A number 1 above an enemy suggests that it won’t attack until a turn. You should be careful when the countdown reaches 1. Many times, you will see more enemies with “1” above them – such pigs will appear more furious than others, which can be clearly seen from the icon above their head. Target furious pigs as they will be the first to attack your birds. In Angry Birds Evolution, smaller pigs have lower number of turns than bigger enemies. You might want to defeat smaller pigs first as they will be the ones who will attack first. However, it’s those bigger pigs that pose a threat. While it’s up to you to decide which enemies to attack first, I would recommend taking out larger pigs as some of them possess special powers, such as summoning extra pigs. Gold: One can obtain gold from any type of battle. Gold can be used to level up your birds. You can also receive gold by sending your scouts on scout missions or by completing daily tasks (tap the calendar icon to get access to daily tasks). Completing all tasks in a single day unlocks a bonus reward, so make sure you check those tasks and finish them as soon as possible. New tasks will replace old tasks every 10-12 hours. Player experience (blue star): Win battles to gain experience. The amount of experience you gain depends on the battle type. The EXP gained fills the player level meter. Once full, you will reach a new level and unlock new game features. For example: Reaching level 4 will unlock a scout team that can be deployed to certain areas to find. Hatch Tickets: You get them from chests. They can used to hatch eggs to get birds. You might also get a premium hatch ticket from premium chests after winning a boss battle, although chances are lower of obtaining a premium ticket from boss battles. Diamonds: Can be used to hatch a premium egg for a guaranteed 4-star bird. You can earn diamonds from boss battles. 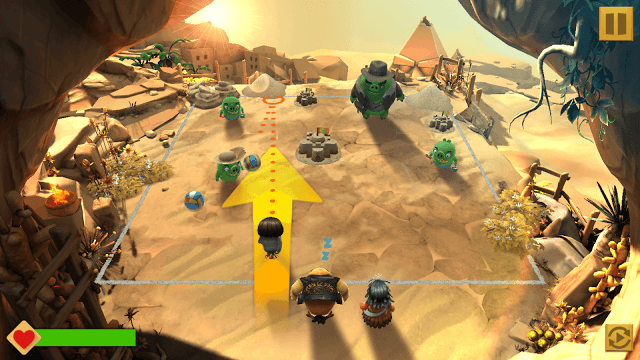 Your angry bird has a super shot that activates after a certain number of turns. A bird’s total turn count can be seen at the top of his head. Once the turn count hits zero, a flame appears all around his body indicating his super shot is ready to use. Every bird has his own signature shot and to know what it is all about in detail, tap the tent icon at the lower left corner of the screen and then tap a bird to bring up team info. There you will be able to see all birds collected so far. Now tap a bird’s profile pic on the carousel at the bottom to know his super shot. Not only you will learn what super shot he possesses, but also know how many turns it will take to activate it. Super shots of some birds activate earlier than others. 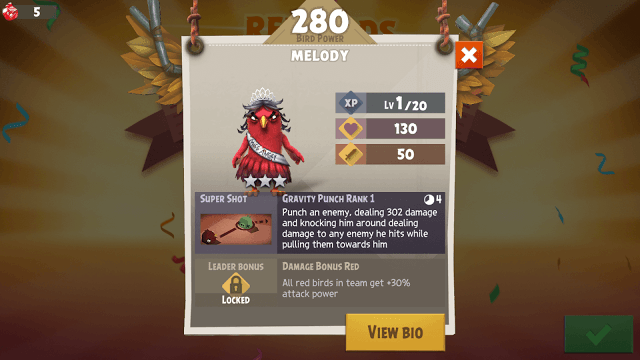 For example Mia’s (black bird) super shot activates after 3 turns, whereas Melody’s (red bird) super shot activates after 4 turns. You might get evolution materials after winning a battle. As the name suggests, these materials can be used to evolve a character to further improve his stats. Evolution materials are color-coded, and each material should be used to evolve a bird of that color. For example: Yellow evolution material can be used to evolve yellow birds, whereas while evolution materials can be used to evolve white birds. Also, each material can be found on certain environments. For example: yellow can be found only in the desert, whereas white material can be found on White Mountains. To evolve a birdie, you will have to max out his/her level. 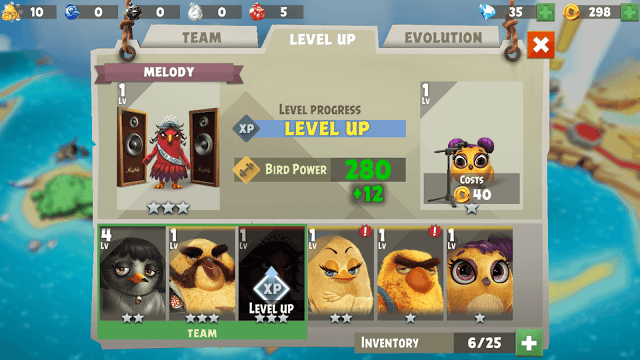 For example: To evolve “Dalton” (yellow bird), you will need to keep leveling him up until he reaches 20, which is his max level. You can then tap the “Evolution” tab and drag Dalton to the blank space. You will need a certain number of yellow evolution materials to evolve him. Hatch eggs at the hatchery to get new characters. Win battles to get eggs. Tap an egg that you receive from a battle to get a bird. Keep collecting birds and recruit higher-star birdies to your team. Use hatch tickets at the “Hatchery” to hatch a regular egg. A regular egg contains 1-4 stars birds. You will need 1 common ticket to hatch a regular egg and 1 premium ticket to hatch a premium egg. You get tickets from reward chests. Don’t forget to play the game every day to receive a daily reward. You might receive a new character some day. The game also gives one free regular egg every 4 hours. You can also get a free premium egg. Tap the golden egg at the hatchery and look for the video icon at the bottom of the screen. Tap it to watch a 30-sec video and get a powerful 2, 3, 4 or 5 star character. You will then have to wait for 2 days to get a free premium hatch.